The right wedding favor gift is unique, personal, appealing, and something your guests will love. It would be a huge waste of money if your guests would throw out the wedding favors before they even got home. Guests want something they can enjoy. There are several cost effective yet elegant ways to satisfy everyone. DIY does not mean cheap, and unique can be achieved without draining your budget. Try these invigorating wedding favour ideas – delicious, unique and classy will be synonymous with your wedding. A personalized take away gift will leave them wanting to thank you and tell someone about it. Cookies, candies and glasses are as well liked as they are versatile. Stimulate your guest’s senses with Homemade goodies. Have them choose a yummy honey or jelly, crunchy granola or a taste bud satisfying mixed nut blend. Throw in chocolate for ultimate sweetness and leave their mouths watering and wanting more. For a unique wedding favor, make sure the flavors are unmistakably delicious. With several options to choose from such as honey, granola, jam, jelly, chocolates or nuts, guests will find their perfect match. Your guests are certain to love little mason jars of sweet or savory wedding flavours. Use mini mason jars (As low as $1.71 each from Beau-Coup) for a DIY sensation. This reusable jar can come in handy to your guests even after the goodies are gone, which probably won’t last past the car ride home. Most vendors will offer customized imprinted messages and a coordinating screw-top lid to make this favor a useful memento. 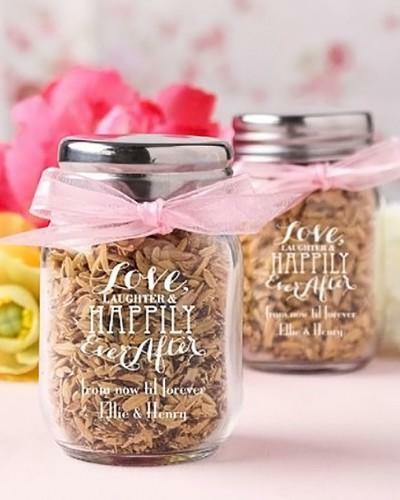 Find more perfect engraved mini mason jars in our curated wedding favors Etsy Tastemaker Page. From wrapped cookies with an icing imprint of your new last name, to glasses etched with your initials and chiming bells, personalized gifts are the gift that keeps on giving. These are not cheap wedding favors by far, but affordable goodies can still look expensive and elegant. Gifting these to your bridal party as a wedding party favor can add to their joyful memories of being part of your amazing journey. These items will not be overstated or untouched and will surely be used for years to come. Cookies or candies can be indulged in, while the wedding memories are still fresh in your guest’s minds. Infuse a spirited reception with a signature beverage to keep your guests refreshed and delighted. You can choose a cocktail or a non-alcoholic drink to leave behind a taste of wedded bliss. You don’t have to have an open bar to serve a signature drink. A signature beverage can create a unified delicious theme throughout your reception. Your guests will be wowed by this wedding favor that can be simply a perfect soda (Jones Sodas offers an array of wonderful flavors). Add the recipe or place a custom label attached to the bottle with a fun and quirky straw. Add a ribbon in the color of your wedding theme and let your guests take home a fizzy favour that leaves them feeling bubbly. Take-along Desserts make the ride home sweet and the next day even sweeter. The ride home can be long and while the mood is high, sweeten the deal with custom desserts. Choose the bakery where your wedding cake was made to keep with your wedding theme. You might even be able to get a discount on bulk quantities of macaroons or petit-fours made especially for filling your wedding favor boxes. Guests will love something decadent and tasty as their take away from your wedding. They can savor each morsel and enjoy their gift that day or the next. Enjoying each decadent bite will put a smile on your guest’s faces. Put a scent of locality with an offering of your neighbourhood novelty to warm their hearts. Aromatic hand soap will be pleasantly remembered and not left behind. If candles are more your style let them burn with desire in each household touched by your special union. For those who are having their wedding in the hometown or a region with a special offering, use that to your advantage. Whether candied bacon or pear scented hand soap are a local novelty, guests will feel nostalgic while enjoying their wedding favor. An apple chutney would be a perfect favour if apples are grown on orchards nearby. Scented candles can keep within the theme of your wedding and remind your guests of your wedding flower or your buttercream cake icing with just one whiff. Make a great wedding favor that features the best regional goodies you can find. Use basic containers and include custom-made tags made of regional offerings or maps of the area. Check with your local store owners and crafters to negotiate a possible bargain. Most would love to be featured in such a beautiful way. A creative favor and a bonus discount will make this gift irreplaceable. Push replay on your day by providing a memory stick with your theme color as its case. Everyone can pick their favorite pictures without having to wait or ask for a memento of your beautiful day. Every great wedding will eventually end, but that doesn’t mean your guests can’t have a lasting wedding favor from your big day. Let pictures tell a thousand words and create a custom flash drive for each guest that includes photos of the events leading up to your wedding, and a playlist of the music from your reception. For an even bigger wow factor, use flash drives in your wedding colors and create handmade tags for each one. This is a celebration of your love and it will be adorable for everyone to see the intimate moments leading to your big day. This favour will also minimize some of the requests for pictures, especially while you are enjoying your romantic honeymoon. This unique take on a wedding favor is easy, fast and cheap. You can get the gumball machine rounds from online retailers and fill with candy or nuts. Affix a monogram sticker to the top, and you’ve got easy affordable favors that will bring a smile to the faces of your guests.